Every November and December, it is that time of the year again! Time for family, friends, parties, and of course, holiday wishes! Writing the perfect wishes for each person might be a tedious or daunting experience. Believe us, we know. We’ve done our fair share of writing holiday wishes. Not to worry, we have some great tips and examples lined up for you! Whether you’re writing holiday wishes for your best friend, your boss or your clients, you should always make sure your message is tailored to your audience. In short, write something personal! Why not convey your holiday wishes in a Season’s Greetings video, like this one? No need to be an expert to create videos like this one! Simply, just sign up and use one of the many Season’s Greetings video templates to create and personalize your own holiday wishes video. I’m truly grateful to have a friend like you! Happy Holidays! May all your dreams for the coming year be fulfilled! Happy New Year! Christmas won’t feel the same without you here, but I hope you have a wonderful holiday time! Wishing we could be together this holiday season! Happy New Year! It’s hard when the Holiday Season comes during a difficult time, but I wish you a new year full of peace and love! I know this probably won’t go down as your best Holidays ever, but know that I’m thinking of you and wishing you the best for the new year. Lots of love. It’s been a pleasure to work with you this year, happy holidays! 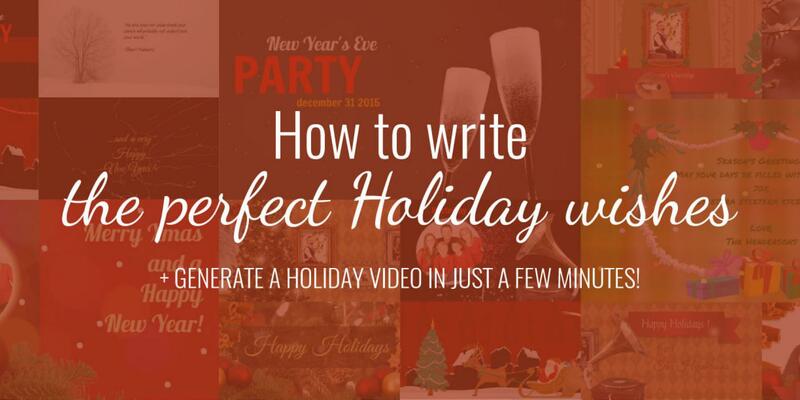 Turn your holiday wishes into a video in no time! A Season’s Greetings video is an attractive way to surprise your friends, family or colleagues with personalized Holiday wishes or to thank your partners and clients for another successful year! Moovly provides stunning easy-to-edit templates combined with a Quick Edit feature that will generate a video for you in only a few minutes. In other words: you can easily create that Season’s Greetings video yourself. It’s easy, intuitive and you can start for free!